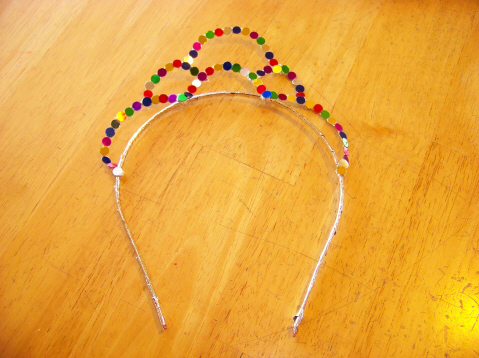 Top off any little princess’ costume with this colorful, easy-to-make tiara, that has shimmer to spare! Tie a small knot with the curling ribbon at one end of the headband. Wrap the entire headband in ribbon, being sure to backtrack over the knot to cover it. Knot off at the other end and cut the ribbon. Use twisty ties to “build” the shape of your tiara, creating the desired shape, large or small. Apply glue to the twisty ties one small section at a time. Press colored confetti or sequins into place. Cover all the twisty ties in the same way. Allow to dry for at least an hour.